Doubtless, many of you are profiting hugely right now from my NBA Overs posts, and it's hard to go wrong right now with them. At last season's entry point, this season we are hitting at an unsustainable 72.7% with a 24-9 record. 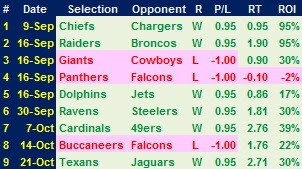 No fewer than ten teams have gone Overs in every game so far. A word of caution is that the bookmakers are on to us. The line was 220 or higher in 32% of matches over the first five days of the season, but since then they have made the line at, or above, this number in 85% of matches. 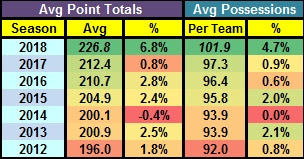 Although I predicted an increase in the average number of points per game, and the number of possessions per game, I didn't expect the increase on last season that there has been so far in both categories. Even the slowest team in the league, the San Antonio Spurs (at 98.0), are averaging more possessions per game than last season's average and are one of the teams going Over in every game so far. Stand by for a correction. The NHL System is back on track after it's Equinox loss, although another system where the early ROI is unsustainable. Another Kershaw Collapse in Game One of the World Series, although not a surprise as Kershaw started as an underdog for the first time since July 2012, a run of 199 games as favourite. After their second win last night, the Boston Red Sox have the Los Angeles Dodgers where they want them, i.e. needing to win four games out of five. They play in Los Angeles on Friday and Saturday, and if the Dodgers can win one of those, the Los Angeles Sports Equinox will occur. No problems mate! I think if someone’s found an edge they’ve done a lot of research and deserve reward. I think if someone's given me a reward, they deserve a few more details - hopefully the information shared will be profitable.